Graves Motorsports Yamaha R1 + R6 + R6S+ FZ1 + FZ8 + FZ09 + FZ10 Turn Signals. These are super bright LED marker lights include the factory style connectors. This means the Graves marker lights do not require soldering to plug directly into your motorcycle, for quick installation. The motorcycle turn signals are easy for surrounding traffic to see. 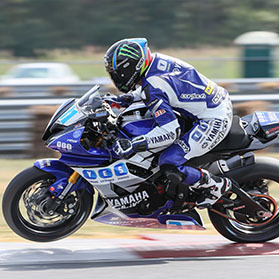 A perfect compliment to your Yamaha sport bike. NOTE: The 2016-2017 R1 and 2017 FZ10 works awesome with these signals but requires changing the plug end to fit respectively. Front marker lights sit in the OEM signal pockets offering a clean, factory look. Rear marker lights can be used with either the stock fender (signal wiring length may require extending on some models for the rear setup) or Graves Motorsports Fender Eliminator Kit. Comes with 2 signals per purchase (enough to do either the front or the back of the bike). Keep in mind LED's have little resistance on your motorcycle and in most cases a flasher relay will be required to even out the flashing rates of your motorcycle. These are assume looking turn signals for a FZ-10. My only grip is that they are not "plug and play" for the FZ-10. You will have to splice them in to the factory connectors!!! The running lights work on the FZ-10. As stated in topic, they are exceptionally built and extremely bright. I am happy with the purchase except for if I simply plug and played them on the front of my 09'R6, both green indicator lights/arrows on the dash would stay illuminated. The green indicators on the dash would still flash with the signals when applied but they were basically "mimicking " the flush mounts. I had to cut the red wire in each of the signals to get the dash lamps to go off so now they are basically signals only and not dual function signals and running lamps.